From Jez Hellewell ... A great race on The Chevin last night. 6.66 km of undulating paths. I was beaten by Spider-Man, as was everybody else I think! No shame in that. Quite a sight with 180+ runners flying around The Chevin with head torches on! From Sally Malir ... The British Athletics Cross Challenge Series got underway on Sunday in Bristol. Georgia Malir made the long journey but made sure that it was worth her while! The course was an undulating, grassy 4.5k and the conditions were blustery. Georgia came in 2nd under 20 women behind Alex Clay (Invicta East Kent). Dan Wilkinson reports ... I ran the Bronte Way and managed 10th in 59:38, starting in heavy rain, then hail, but finishing in beautiful autumn sunshine outside the pub. Tim Ellis CVFR won in 53:11, 180 finished. Results. Simon Jenkins reports ... It was a breezy and showery day with a bit of sun. The course was undulating through some of the less salubrious back streets of Bradford. The cold rain certainly made you want to finish as quick as possible! 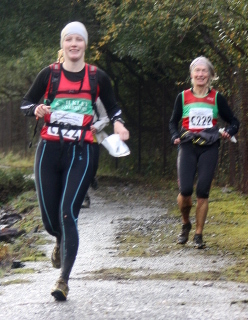 From Alison Weston ... took part in a great AM fell race in Guisborough on Sunday. Starting from the rugby club the race took in High Cliff, Roseberry Topping and Hanging Stone before going back up the moor to a 4th trig point beyond High Cliff. So it should be the 4 tops race really! I finished in 1hr 30 but not sure of my position. Lots of good running with a bit of route choice too. Results up now from two days of racing on the Brecon Beacons. Andrew Priestley and former Harrier Heather Dawe were 1st ladies on the Elite course. Quite a few other Harriers in it: Jack Wood 8th on B Class, Outi Kamarainen 17th and 3rd Mixed team on B, Emily Wood 60th and 4th ladies team on the C (any more? Let us know your results, please). From Peter Shields ... went over to Wales to support two of of our athletes today in the Snowdonia Marathon. As marathons go this is one of the toughest in the UK and has to be given a lot of respect. Nick Pearce and Val Kerr dipped their feet into the magic of this event and performed brilliantly. Nick ran 3h21:21 to win the male V60 race and Val ran 3h55:13 to come fourth in the fv50 race. Following the race as it circuited Snowdon from Llanberis was inspiring, especially with our two athletes to support. The course is a little more than undulating with two very significant climbs of 6.5 and 5+miles plus the odd one in between! Val and Nick looked well throughout and as I said gave inspiring performances, well done to both of them. From Val ... Awesome - both the race and Nick's performance (I even spotted him at the top of Pen-y-Pass on the S4C TV coverage). 4 hours with no rain, magnificent scenery, a fabulous course (in spite of the hills) and a finish that every fell runner would die for. Thanks to Mark and Pete for their great support around the course. The winner was Rob Samuel (Eryri Runners) who notched up his third victory in 2:43:50. This has to be one of the best marathons in the UK and I would definitely recommend it to anyone who doesn't mind a few (big) hills. Entries open on 1st January but it fills up very fast (2000 limit). From Will Buckton ... Six Ilkley Harriers made the much shorter trip to Kettlewell for the Great Whernside fell race. The demanding FRA Category A Short route climbs 475m to the summit in just 3.25km. Martin Archer, Jim Ryder and Will Buckton arrived at the top in close succession and Martin made a flying descent to come home 16th in a strong local field. 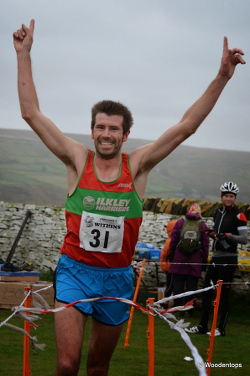 Will Buckton reports ... Ilkley Harriers rounded off the fell season with strong performances at the FRA relays (Aka the UKA British Fell & Hill Relay Championships) in Llanberis, North Wales. Tom Adams brought the men home in second after leg one, less than a minute behind Murray Strain of HBT, leaving Dan Wilkinson and Rob Cunningham with the task of following Tom on leg two. Will Buckton and Nick Pearce navigated their way safely through leg three to pass over to Dave Wilby who was 20th on his leg, bringing the team home in 28th overall out of 99 teams. Ilkley ladies' Kate Archer was 13th lady on the final leg in a strong field of 32 to help the team to 20th ladies overall. From Will Buckton ... 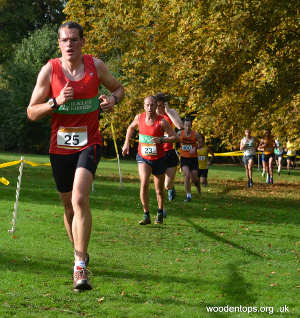 The West Yorkshire Cross Country League got underway at Wakefield and Ilkley were well represented in both the male and female races. Sally Morley had an excellent run to finish 7th, less than two minutes behind winner Pauline Munro of Wetherby. Jamie Hutchinson was first Harrier in the men's race, finishing 49th and helping Ilkley to 11th team. There were some fabulous results from our juniors, from the very first race of the day which we won (and won the team event in) and throughout the junior classes. Nigel Tapper tells all ... another great turnout for this year's International road challenge with excellent category positions by some in what turned out to be a very tough event! Most people would rather forget the very congested, narrow out'n'back first 6km, the gloom and the heat/humidity but looking at the results we didn't do so bad in a field full of club runners with few or no fun runners to be seen! The course started and finished outside Bilbao's Guggenheim Museum to a crescendo of fireworks. The route took in out and back paths and roads both sides of the river with a significant city centre loop. Congestion and on-coming runners over the first 6km were the initial challenges followed by heat and humidity in that order. We reckon most people were probably about 5 mins down on their usual times due to the conditions. Nevertheless it was certainly different and can be ticked off our bucket list even though nobody appears keen to repeat it! From Race Organiser Dave Woodhead ... "Tom Adams is maturing into one of Britain's best athletes and smashing Alistair Brownlee's 2006 course record time by 2 minutes is only enhancing this fact. Remember Alistair, 18 years old back then, had just returned from competing in the Beijing Olympics and was the World Triathlon & European Duathlon champion." 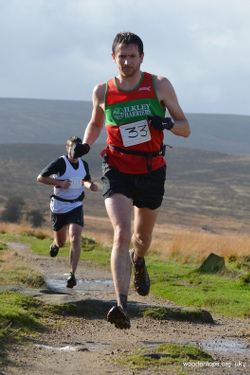 From Dave Wilby ... Will Buckton set a great new PB, Ben Sheppard wasn't far behind in his first ever Lakes fell race (!!) and Jane McCarthy was a fabulous 5th lady and 2nd V40, behind the winner of the Lakeland Classics series and the joint winners of the English & British Champs...fine company indeed!! Loads of other Harriers out, great to see a good turnout at a proper fell race, perfect day for it. From Ben Sheppard ... So this is Lakeland fell racing. Steep climbs, boggy traverses, technical descents, splendid views, a couple of hairy moments, a pastie and a pint in the good company of kind and generous clubmates. Some classy and gutsy performances from Harriers not only at the front of the pack (Dave and Jane in the prizes) but throughout the field, some first timers and some seasoned veterans - in Bob's case a mere 31 years after his previous running of this race! Be inspired by Bob's photo story of the day. Jane McCarthy, Kate Archer, Clare Smith and Eleanor Bradley. From Jean Sullivan ... A superb location, with fantastic scenery for this 13.895 mile run! Lots of sunshine, great send off and welcome home by a local jazz band and excellent home made cakes available afterwards! Jonathan Sinclair adds ... Saw Alex's heels for the first 2 mins and sorry I didn't see Jean to say hello (or Ben Shepherd who usually comes to this one and I see has been posting some great results this year) but did reach the finish rather more slowly than last year. Wonderful to be out again after a few months injury. 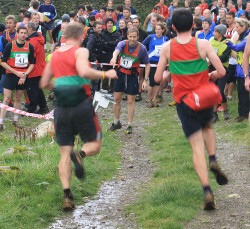 From Will Buckton ... the IHMR is an ultra competitive event as the northern fell running clubs take their strongest runners to the Lake District to take on the 40km/2450m ascent, split into four legs. Visibility on the day was poor and navigational skills were required as well as fitness - eight teams were forced to retire lost. Ilkley's men showed their strength in depth as, despite sustaining some last minute injuries, they were able to take a strong team and made no navigational errors to finish 20th overall in these challenging conditions. Ilkley ladies rounded off their impressive season with fourth in a close competition. From Neil Bloor ... took a trip to Chester but limped over the line in 4h16 after a bad cramp attack in the heat at mile 21. However thought it worth mentioning what a great event this was - really well organised, very enthusiastic supporters and refreshment volunteers, the organisers even welcome everyone personally over the line at the end. There were around 4500 entries and both male and female course records were broken this year which made it interesting for spectators.